This summer, while road tripping through Nevada, you may pull up to the sleek silver cab of an 18-wheeler, and get a shock—the driver isn’t looking at the road, and his hands aren’t on the wheel. Is he…reading? Daimler driverless Freightliner Inspiration truck. 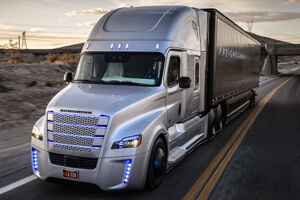 Nevada, one of the first states to write legislation regulating the testing and operation of driverless vehicles, just okayed Daimler’s futuristic Freightliner Inspiration driverless trucks for the highway. But truck drivers need not fear for their jobs—these trucks won’t replace any humans just yet. They’re here to help. Think of it as autopilot for long-distance truckers. The truck uses cameras, sensors, and radar to scan the area all around it and determine its position on the road and in relation to nearby cars and trucks. Some of these features—staying in lanes and maintaining a safe following distance—already exist in top-of-the-line Daimler cars. This is the next step. But unlike Google’s driverless cars, the trucks don’t use LIDaR (a spinning laser-based sensor) and, at present, they are only able to drive highways—not city streets. Now they’re approved, however, Daimler’s two autonomous trucks will go on the road (with a driver in the cab) and begin racking up miles. Like all driverless technology, it’ll take time for both the public and regulators to get comfortable with the idea—and a real-world driving record, clean of major incidents. The early benefits, according to Daimler, have less to do with replacing drivers and more to do with fuel economy—algorithmic drivers are less erratic and can even form caravans to perform some nifty drafting to save gas (see video)—and making long-haul drivers’ jobs easier and safer (for them and us). Indeed, for now, humans will remain firmly in the driver’s seat. The trucks will hand off the controls whenever they’re overmatched by conditions or there’s a problem with the system. If the driver doesn’t respond fast enough, the truck will decelerate and stop until they do. 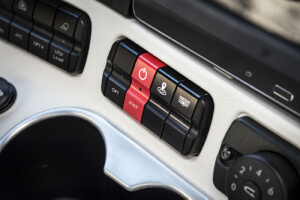 Drivers would push the red button to hand over controls to the truck’s ‘highway pilot’ system. It’s easy to see the potential of autonomous trucks. Some 3 million trucks and drivers haul 9.2 billion tons of freight (almost 70% of the total) across the US every year. Even assuming no further advances in the technology, and unlike other kinds of driving, much of trucking could, in theory, be automated soon. A good number of miles driven are dry, highway miles. We could even imagine a truck operating mostly without a human driver, then, as it approaches town, easing into a designated pull-off or parking lot where a human operator, already alerted of its ETA, waits to drive it the last few miles. Similarly, in the event of bad weather, which is somewhat predictable, the truck pulls off the road and either waits it out or calls in a human to guide it through the worst conditions and hand back the reins. All this seems plausible even at a technological standstill. And further advances, like better sensors, machine learning, cloud AI, and vehicle-to-vehicle communications will increase the number of driverless miles possible. But Daimler thinks it’ll take a decade for everyday use of driverless trucks. No doubt, this is in part because we want to work out every kink in the technology and test it rigorously. But it’s also getting comfortable with the idea of 40 tons of freight and steel being piloted by a computer program. In theory, it’s way safer—in practice, until well-proven, it’s a little terrifying. 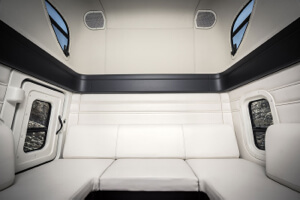 The truck’s plush interior includes this wrap-around sofa bench and bed. Google’s cars, for example, have driven a million miles accident free. But we aren’t anywhere close to removing the steering wheel, gas, and brakes on most commercially available cars. We’ll likely need a similarly lengthy and reliable track record for driverless trucks before we remove human drivers for extended periods. But don’t expect testing to last forever. As robots continue taking over dull, dirty, and dangerous jobs—truck driving is a likely target for the next round of automation. Indeed, transportation in general, is a likely target. Ships carrying oversea freight could also become far more automated in the coming years. Nevada and Daimler’s experimentation, then, is the beginning of this new era of automation. And in the end? We won’t bat an eyelash at robot trucks—not least because no one’s at the wheel of our car either.